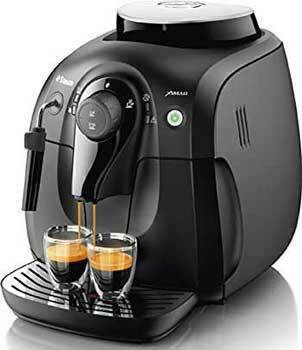 A solid entry level machine, capable of making all your favorite specialty coffee drinks. Recommended for: Beginners, hobbyist and casual coffee drinkers only. The reservoir is too small to satisfy power drinkers, and there aren’t enough options to satisfy purists. Are you on a budget and new to the world of specialty coffee drinks? Are you eager to begin exploring all the flavor possibilities that the world has to offer but unwilling to spend a fortune to do it? If so, then you’re going to enjoy our detailed Saeco XSmall Vapore review. If you don’t mind a little hands-on work, this machine will not only serve you well but will also give you plenty of opportunities to let your inner-Barista out to play and practice! Fair warning though – the Vapore is an entry-level, value-priced machine. Not only do you run the risk of outgrowing its capabilities, but being value-priced, it’s also never going to be accused of being feature-rich. It can do the basics but don’t expect much more than that. Having said that, let’s jump right in and have a look at what the Vapore can and can’t do! First things first. The “X” in “XSmall” isn’t a typo! It signifies that the machine is X-tra small. We’ve had some readers asking about that and just wanted to clarify! Now, onto business, the first thing you’ll notice about the Saeco XSmall HD8645 is its retro 90’s styling. If you’re a fan of the 90’s, this will be quite appealing to you. If you’re not, you’re probably going to think it’s rather ugly. We have fond memories of the 90’s, so we don’t mind its appearance in the least. It’s what someone living in the 90’s would have thought of as “futuristic.” The machine is dressed all in black with a few metal highlights (drip tray) and manufactured in Romania of sturdy ABS plastic. All or mostly plastic is not uncommon in value-priced machines, and there’s certainly nothing wrong with that, but do bear in mind that it’s just not going to hold up as well as a machine that’s mostly metal. This isn’t an heirloom piece, and once it breaks down, you’re probably going to have outgrown it anyway, and be ready to move on to something more robust. In terms of size, it’s got a larger footprint than you might expect, measuring 15.2” x 16.7” x 15.3,” and weighing in at 15.7 pounds. There are certainly smaller machines on the market, but unless you have extremely limited counter space and low clearance between your countertop and the bottom of your kitchen cabinets, finding a permanent home for the Saeco Vapore XSmall shouldn’t present much of a challenge. Even if it does, and you find yourself having to move it on a regular basis, it doesn’t weigh much, and won’t present any challenge on that front either. This is a key component of any espresso machine and an important part of our Saeco XSmall Vapore review. Sadly, we were underwhelmed with the size of the Vapore’s front-loading water reservoir, which only holds 33 ounces of water. We’ve seen smaller machines sporting bigger water tanks, and our view is that this was a missed opportunity for the company. They could have easily expanded the size of the tank. Although the machine doesn’t come with one, it will accept a water filter. We have a love/hate relationship with water filters and will outline both the pros and cons for you so you can make up your own mind. There are no “right” answers here. In the end, it comes down to what’s most important to you. You can trade added cost for convenience, or not. 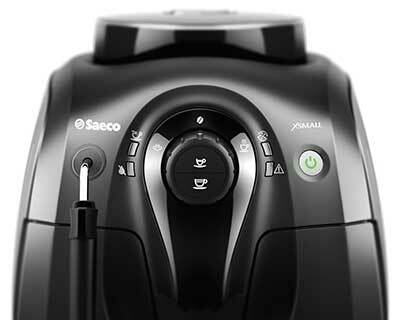 Although we were somewhat disappointed by the size of the Saeco XSmall HD8645/47’s water tank, we readily admit that it’s got good synergy with the top-loading bean hopper, which holds up to 6.5 ounces of beans. Too often, we see machines where there’s a huge mismatch, offering a large reservoir paired with a very small hopper, or vice versa. The problem with a mismatch like that is that it forces you to stop what you’re doing on an almost-constant basis to attend to the needs of one or the other. Although smaller than we’d like, these two items are well-paired, and if you’re only a casual coffee drinker anyway, neither will present a problem for you. If you’re a power drinker, you’ll be annoyed at how often you have to refill them both. 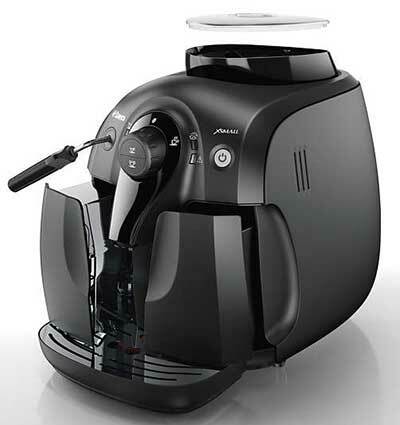 The hopper feeds its beans into a flat ceramic grinder with five different grind settings. We prefer a conical grinder to flat but understand the decision here. Use of the flat grinder helped keep costs a bit lower, so we can’t fault Philips for that, and they did splurge and give us a ceramic grinder, which we love. Grinders come in two flavors: Stainless-steel and ceramic. Of the two, ceramic is almost universally regarded as superior, because stainless-steel heats when used, and can sometimes burn your grounds, utterly ruining the taste of whatever drink you’re making. Happily, that’s not a concern here! While we’d love to see more grind settings, realistically, on a machine at this price point, five is about as many as you can expect. That’s a sufficient number of settings to satisfy people who are new to the world of specialty coffee drinks, but sooner or later, you’re going to wish you had more. To get more, you’ll need to invest in a more expensive machine. Note: To change the grind settings, you’ll have to use the grinder wrench that accompanies your unit. Don’t lose this, or you’ll be stuck with whatever grind setting you last had the machine set on! One thing this machine doesn’t have, however, is a bypass doser, so there’s no option to use pre-ground coffee. As you’ll see, the deeper we move into our Saeco Xsmall superautomatic espresso machine review, this is one of many features Saeco left off in a bid to keep the price low. Pro Tip: Super-Automatics don’t like oily beans! No matter which model you buy, this or some other, be sure to find a nice medium roast you like and stick with it for best results! 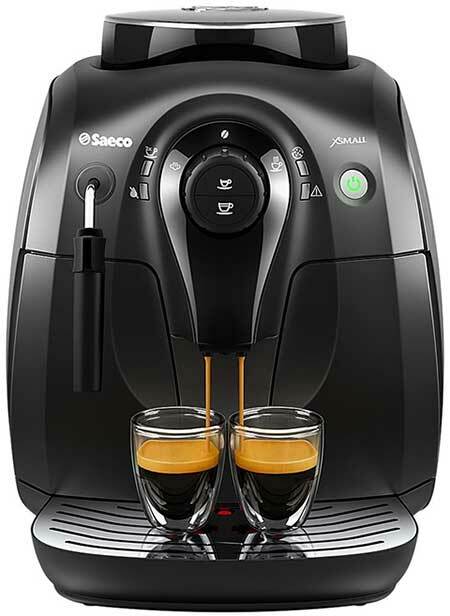 It should come as no surprise on a machine in this price range, but the Saeco XSmall super automatic espresso machine uses a single aluminum boiler, lined with stainless-steel and featuring Thermoblock technology for rapid heating. The primary significance of a single boiler is that you can’t simultaneously steam milk and brew coffee, but the delay as the boiler shifts gears from one to the other is measured in seconds, not minutes, so it’s not a deal breaker. Just something to bear in mind! One thing to note here (and something we’ll talk about further in a later section) is that there’s no way to adjust the temperature settings for either milk or coffee. You get what you get, period. Most value-priced machines offer at least two, and sometimes three different programmable temperature settings, so this is rather significant, and is another example of Philips stripping out features to keep the price of the machine low. This will be a short section because the coffee spouts of the Phillips Saeco XSmall Vaporedo do not telescope up and down. They’re fixed in place, and will only accommodate a maximum cup height of 3.74”. Again, that’s probably not a big deal if you’re a casual drinker, but we’re power drinkers, and usually use “Texas Shot Glasses” 32, and sometimes 64 ounces in size. If it weren't considered a party foul, we’d probably guzzle coffee straight from the pitcher, so of course, this is much too small for our liking. There are only a few things to talk about here, because of this model’s limited feature set, but we’ll go over it in detail. The first thing to note is that the brew unit is accessible via the right side panel as you’re looking at the machine, and is removable for easy once a week cleaning. 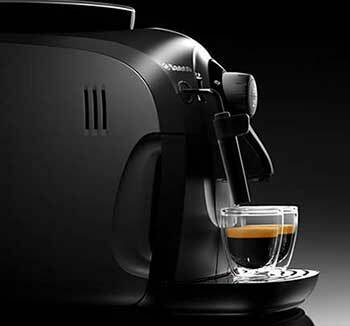 As far as the control system goes, the Saeco espresso machine XSmall is decidedly old school. Pure analog, with buttons and knobs. No LED, LCD, or any fancy tech. Just a few simple buttons to control how much water goes in your shot, milk, and steam. Here’s another thing that Philips left off. There’s no way to control dose strength. Again, you simply get what you get, which is another reason coffee purists aren’t going to like this machine and given that there’s no type of digital control system, you can’t program an auto-start or auto-shutoff time either. The brew pump on the Philips Saeco XSmall Vapore is rated at fifteen bars, so you’ve got plenty of pressure to make a great shot of espresso, although if you’re new to this world, that does bear a bit of explanation. Espresso machines aren’t like the drip-brew coffee makers you’re used to, which rely on gravity to get the water from the grounds chamber and into your waiting cup or pot. These machines use pressure, which is measured in bars, with one bar of pressure equal to the atmospheric pressure at sea level. It takes at least 9 bars to make a good espresso, so again, you’re in good hands with the Vapore. If we had to name one thing as being the stand out feature in the Vapore’s design, this would be it, and most of the Saeco XSmall automatic espresso machine reviews you find online sing its praises on this front. New users are sometimes intimidated by the presence of a frothing wand, but don’t be! Yes, it takes some practice to learn to use well, and yes, it’s true that your first three or four milk-based drinks probably aren’t going to turn out quite the way you had hoped, but keep trying! With practice and a bit of patience, you’ll master the art of the frothing wand, and be making world-class froth in no time. You just have to be willing to let your inner Barista out to play and experiment! Pro Tip: The steaming wand also doubles as a hot water dispenser, allowing you to make tea, hot chocolate, and other hot drinks! Sorry, if you were looking for a machine with a cup warming tray, you’ll have to look elsewhere. That’s yet another feature the company left off of the Saeco XSmall automatic espresso machine in a bid to keep the price low. The absence of the cup warming tray matters more than you might think, too, because specialty coffee drinks were meant to be enjoyed at a temperature lower than the coffee most Americans drink. Since you have to steam milk at an even lower temperature, lest you run the risk of spoiling it, any milk-based drink you make will be somewhat cooler than a standard shot of espresso or an Americano, and if you dispense your drink into a cold cup, the heat loss is even more dramatic. The cup warming tray is a powerful weapon against heat loss, and without it, your best bet is to pre-warm your cup by dispensing hot water from the machine and letting it sit until you’re ready to brew. Since there aren’t many options, or buttons and knobs, and there aren’t many features, this machine is incredibly easy to use and master. It’s arguably easier to use than the coffee maker you’re using right now, and there’s something to be said for simplicity. 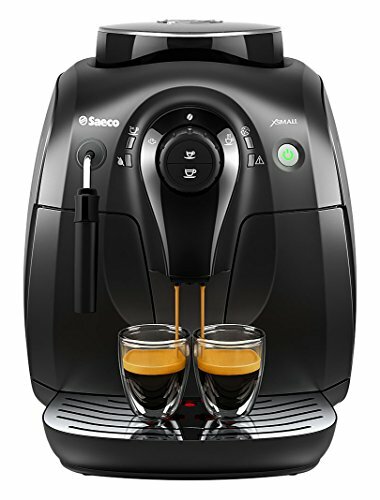 As you can see in our Saeco XSmall superautomatic espresso machine review, while the machine has got the basics covered, there are a lot of things it can’t do, and some of them could be added back without significantly increasing the cost of the machine. In our view, the two biggest shortcomings (besides the tiny water tank) are the fact that it doesn’t allow you to adjust the amount of beans in your brew (dose strength), and it doesn’t have a bypass doser. If they added those things in, we’d easily award it another half point. The upshot is that it’s a really inexpensive machine that gives you all the basic functionality to create just about any drink you want. If all of those apply to you, you’re going to love this machine. If not, you’re better off looking elsewhere. Espresso Recipes: Analyzing Dose. Barista Hustle. Single Boiler vs. Heat Exchanger? CoffeeGeek. How to Make a Latte. Good Food.